Beauty, elegance, and luster are words that instantly come to mind when in the presence of this Cirros Milan unisex white ceramic watch. A simple but classy and elegant design is on the face of this watch. The words Cirros Milan are printed at the top. In the middle are the silver hour, minute, and second hands. Below them is the word Ceramic, and below it, at the six hour position, is the date. Equipped with Japanese quartz movement, you can count on this watch to keep accurate, precise time. 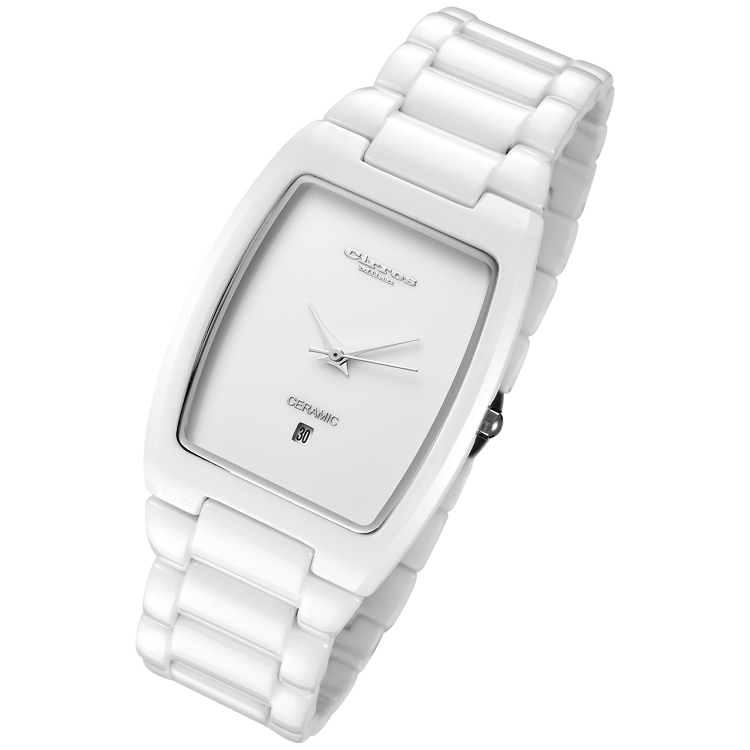 The crystal on this luxury, white ceramic watch is sapphire, which means that it has a high level of scratch resistance. As a matter of fact, sapphire crystal is the most scratch resistant crystal among the three common crystals of mineral, acrylic, and sapphire. It is the most expensive and durable of the three common crystals and is approximately three times harder than mineral crystals, and 20 times harder than acrylic crystals. Furthermore, having a water resistance up to 3 ATM / 30 Meters / 99 feet means that you can perform your ordinary tasks, without worrying about ruining this beautiful timepiece. The band on this white ceramic watch comes in one size and is made to fit a wrist with a circumference of 215 mm / 8.46 in, but it can be resized to any wrist. The luster of the hi-tech white ceramic, the hands, and the silver border on the face of the watch, along with the simple design of the dial, beautifully come together to form a thing of beauty. This beauty, in addition to its features, make this watch something that truly must be seen, and that you will be proud to adorn on your wrist. Wear this luxurious, water-resistant, accurate time keeping watch with date indicator with confidence and peace of mind because Cirros Milan backs it with a 1 year international warranty.